A sculptor for 15 years (and painter before that), artist Diane Husson, resident of Norfolk, Virginia, recently stumbled upon a new concrete product that has quickly become her favorite medium for castings. Although she used a gypsum-based product for years, the Virginia Artist was unhappy with the lack of durability her castings seemed to have. Through her search for a new product, she came across the easy to use Xtreme Series Hybrid GFRC System. 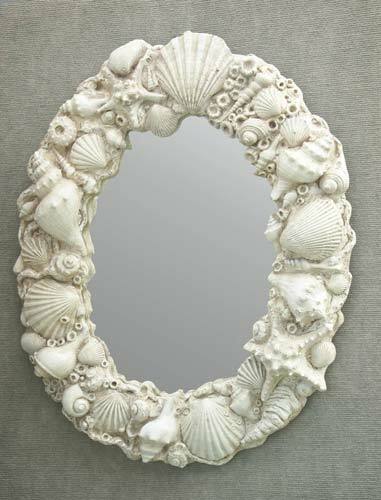 All of her smaller castings, such as this 13″ mermaid, and many larger castings, like this 30″ tall shell mirror frame, are now made from Xtreme Series mixes. These pieces are durable enough to withstand the outdoor elements, something that couldn’t be said with the previous product used. The shell mirror frame was made from a custom mould. First, after diluting to the desired consistency, Xtreme Series PreCast was brushed into the mould as a thin coat to insure all of the details would be clearly visible. Next, Backer Mix was pressed into the mould, keeping the piece as hollow but as sturdy as possible. Lastly, the hardware was pressed into the Backer Mix in the appropriate places. 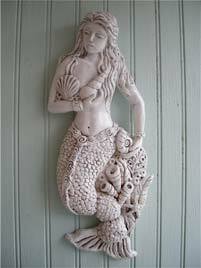 Diane’s castings and other works of art are found on walls of homes and businesses all over the U.S. and some have even made their way overseas. See her work at newrelics.com.